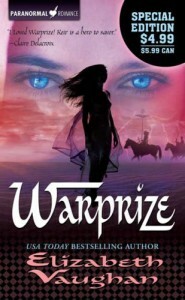 Warprize will sweep you away. Into a new land with new people, their customs, the politics, and into the arms of Keir the Warlord. A well written fantasy romance. It has just enough world building to pull you in but not overwhelm you. The characters, Lara and Keir, are addictive. And the plethora of colorful supporting characters will make you laugh, cry, and cringe. Thank goodness the rest of the series is available, onto book number two!